Transport groups, led by the progressive Pinagkaisang Samahan ng mga Tsuper at Opereytor Nationwide (PISTON), are staging a transport strike today (Sep. 19) in selected routes in Metro Manila as well as in various regions around the country. PISTON and its allies are pushing through with the strike and people’s protest despite the last-minute turnaround of other transport groups following their dialog with President Aquino last week. Aquino, who promised to be the total opposite of Mrs. Gloria Arroyo, is employing the same tactic of his predecessor when faced with the threat of a transport strike – intimidate the jeepney operators with a cancellation of their franchise. But PISTON members are unfazed and they have every right and reason to go on with the strike even after Aquino ordered a review of the Oil Deregulation Law. The strike should send a strong message to Aquino and the oil companies that the grave abuse they inflict on the public transport sector and the people must stop. Unabated oil price hikes since the start of year have already eroded the daily income of jeepney drivers by about P158 (based on the P5.25-total diesel price hike since January and the 30-liter a day average consumption of a jeepney driver). This is reason compelling enough for drivers to strike. But worse, the increases are unjustified despite the repeated claims of the oil firms, echoed by Energy officials, that they are simply reflecting the movement in global prices and foreign exchange (forex). Because of unregulated price adjustment under the Oil Deregulation Law, oil firms have more space to abuse consumers such as through local overpricing, or imposing domestic pump price adjustments that are much higher than what global prices and forex warrant. It must be pointed out though that global oil prices are already artificially high due to monopoly pricing and speculation. But local overpricing certainly worsens the impact of exorbitant global prices on the people. Allegations of overpricing come not only from activists. Senator Ralph Recto, when he was still the Director General of the National Economic and Development Authority (NEDA), for instance, accused the oil firms of overpricing the public by P8 per liter. Our own estimate is that diesel is overpriced by about P7.60 per liter and unleaded gasoline by around P9.85. These figures represent accumulated monthly overpricing from January 2008 to August 2011. The process detailing how we arrived at these estimates is discussed here. By selling overpriced diesel and unleaded gasoline, the oil companies raked a total estimated extra profits (on top of their regular profits) of P66.19 billion from January 2008 to August 2011. Meanwhile, the government also has its share of the loot through the 12% value-added tax (VAT) imposed on overpriced diesel and unleaded gasoline to the tune of P9.03 billion. Thus, a total of P75.23 billion has been over-collected from jeepney drivers and other consumers since 2008. 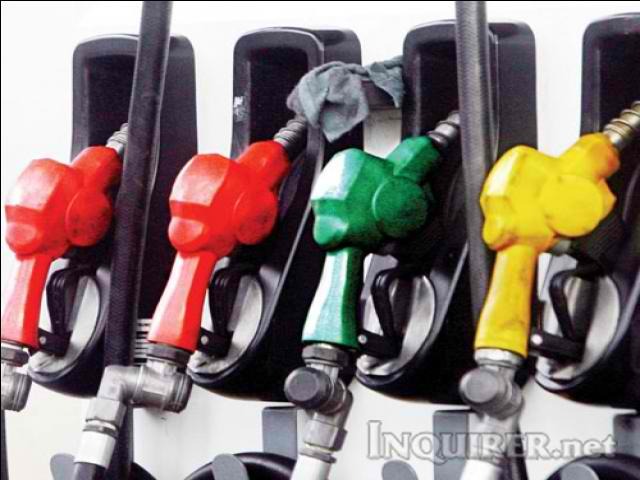 Of this amount, P45.05 billion came from diesel and P30.18 billion from unleaded gasoline. The estimates were derived from multiplying the estimated annual overpricing in diesel and unleaded by their respective demand from 2008 to 2011. For instance, from January to August 2011, the accumulated overpricing for diesel is 88 centavos per liter. Using 2010 daily demand figures for diesel (2011 data are not yet available) of 19.63 million liters multiplied by 243 days (January to August), the estimated extra profits and VAT collections from overpriced diesel is P4.19 billion. 12% of this amount represents government’s VAT collections and the remainder goes to the oil companies. Using this same process, we estimated the extra profits and VAT revenues from overpriced diesel and unleaded gasoline in 2008, 2009, and 2010. Furthermore, using the annual distribution of the local market per oil company, we can also estimate how much extra profits due to overpricing are collected by each of the Big Three. Of the P75.23 billion, P26.75 billion went to Petron Corporation; Pilipinas Shell, P19.85 billion; Chevron Philippines, P8.82 billion; and the rest of the oil players, P10.78 billion. The remainder, as mentioned, went to the government as additional VAT revenues. You may access the Excel files of these computations here. If you think that these figures are scandalously high, they are actually just peanuts compared to the billions if not trillions of dollars that the investment banks and the global oil giants, who supply the country’s petroleum needs, pocket in superprofits from monopoly pricing and speculation. You may download a PowerPoint presentation on the global oil industry here. Direkta at buong-buong pinapasan ng mamamayang Pilipino and lahat ng pang-aabusong ito dahil sa Oil Deregulation Law. At kasabwat pa ang gobyerno sa pang-aabuso sa pamamagitan ng VAT.